One of the things I've always liked about Apple's Mail application is that when new messages arrive, Mail's Dock icon tells you how many. However, one limitation of this feature is that the number displayed includes only those messages in your Inbox; if you've got a number of Mail Rules set up to automatically file messages into folders—or if you've manually moved messages to other folders but kept their status as unread—Mail's Dock icon no longer counts those messages. Because of this limitation, back in June of 2004 I recommended MailEnhancer 1.11 as a useful add-on to Mail that (among other things) changes the Dock's status icon so that it reflects all unread messages in all folders. But now I've found something even more useful: Ecamm Network's $8 DockStar 1.0. This nifty Mail add-on not only lets you decide exactly which unread messages are counted by Mail's icon, but lets you have multiple indicators, as well. For example, you can use one indicator to tell you how many unread messages you have in total, another to tell you how many of those messages are from your work account, and another to display how many personal messages are unread. That may sound confusing in text, but it's actually quite easy to use. After installing DockStar, a new settings panel appears in Mail's own Preferences dialog. The example Mail icon on the left of the dialog displays the current indicators (badges); on the right are pop-up menus from which you can choose the source for each badge—which of your mail inboxes or folders it monitors. You can choose any Inbox or folder, including Smart Folders. For example, I've got badge #2 set up to monitor a Smart Folder that includes messages with High priority. If you've got multiple mail accounts, you can even monitor each account's Inbox; for example, in the screenshot above, badge #3 is monitoring the "communal" Inbox (all inboxes combined), whereas badge #5 displays only those unread messages in my .Mac Inbox. You can also disable particular badges—if you don't need all five indicators, you can choose None from any badge's pop-up menu to disable it completely. To make it easier to differentiate between indicators, DockStar also lets you choose the color, shape, and size of each. Granted, if you don't use Dock magnification and your Dock is getting crowded (and thus has smaller icons), DockStar's display may be difficult to read. But apart from this limitation, I'm finding DockStar to be a real productivity enhancer—with a quick glance I can see not only if I've got new mail, but whether or not it's mail I need to get to right away. 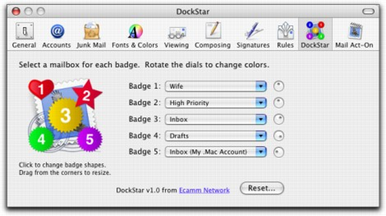 DockStar enhances Mail's Dock icon to provide finer-grain new-email notifications.